The Willamette Valley is known for its wet and cold soil conditions in the early spring. Although these conditions are not ideal, sweet corn and other crops have to be planted as early as possible in order to make a full use of the short summer season. Under these soil conditions, the vigor (i.e., vitality and strength) of seeds can make a difference between the success and the failure of a crop. A fast and uniform stand establishment is critical in all farming activities, especially those crops that are planted in the early spring, where a plant is expected from every seed in the row. Why is a vigor test needed? One may ask why the need for a vigor test when a germination test is already available. This issue used to be a typical argument among seed scientists, but not any more. A standard germination test, which most farmers use to determine their seeding rate is performed under ideal laboratory conditions (e.g., optimum moisture, temperature, light, no soil microbes, etc). These conditions seldom occur in the field. The standard germination test has been designed to determine the highest germination potential of a seed lot under ideal conditions, but not to differentiate between seed lots based on their capabilities to perform better under harsh field conditions. This may explain the puzzle when several seed lots with similar germination percentages result in totally different stand establishments in the field. Thus, today vigor testing has become an important management tool and routine practice in many crop production programs in the US, especially when seeds are planted in the early spring. The need for vigor testing is even more dramatic in the Willamette Valley in Oregon, where soils are typically not only cold but also have excessive moisture content during the early spring season. To simulate the field conditions in the early spring, seeds are germinated under cold, wet soil conditions similar to that expected in the field. A seed lot that shows high germination under such stress conditions is an indication of high vigor. Evaluate fungicide efficiency, especially when soils have high pathogen levels. It requires a laboratory with sufficient space, equipment and experience for precise evaluation. The cold test is the oldest and most commonly used vigor test method in the United States. It has been used for field and sweet corn, sorghum, dry beans, peas, soybean, onion, carrot, spinach, canola, and other crops. 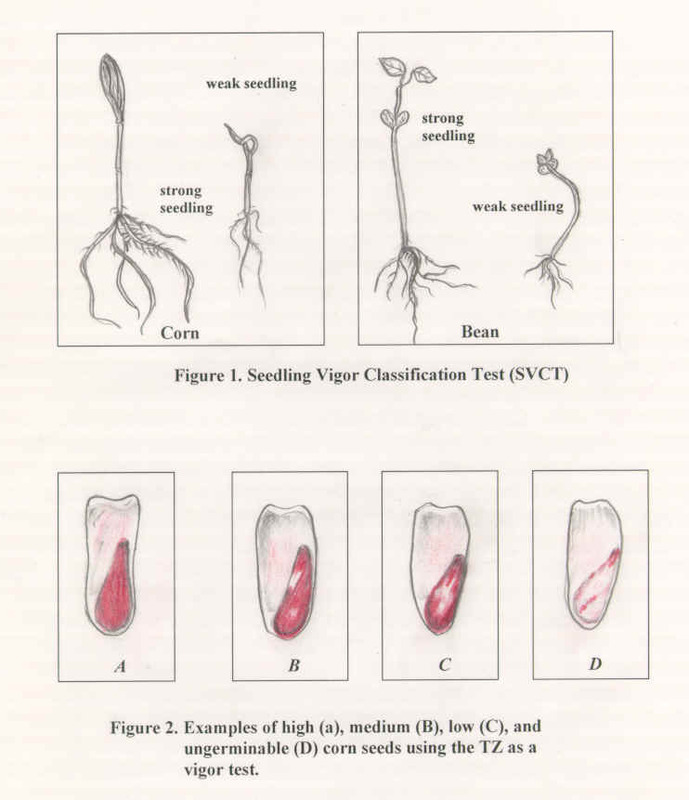 This vigor test is an expansion of the standard germination test (SGT). The normal seedlings obtained from the SGT are further classified into ‘strong’ and ‘weak’ categories. This classification is made based on strict evaluation of the essential seedling structures such as: root system, plumule, hypocotyl, epicotyle, cotyledons and endosperm. This is a good vigor test for corn, garden beans, soybean, cotton, peanuts and other crops. It is simple and fast since it uses the normal seedlings obtained from a standard germination test for further evaluation. It does not require additional equipment, but sufficient technical qualifications for accurate evaluation. It is a quick biochemical test to determine the viability and vigor of a seed lot. It is useful when growers need to make a fast decision about the planting value of their seeds within a very short time, 24-48 hours, rather than waiting several weeks for standard germination test and/or other vigor test results. The TZ test distinguishes between viable and dead tissues based on the respiration activity of seeds (i.e., dehydrogenase enzymes activity). Living cells will stain with red color while dead cells remain colorless. Vigor evaluation is made on the basis of color intensity, location, missing embryo parts, fractures, and location of imperfect embryo parts within the essential embryonic structures (Figure 2). Determining viability and vigor of species with high levels of dormancy. The applicability to a large number of species. Useful tool to determine any damage that occurs to the seeds during harvesting, conditioning, or storage. If a seed lab is already performing TZ test for viability, it does not require additional equipment to determine the vigor, but simply additional technical qualification of the seed analyst. The accelerated aging test is well known to estimate the potential storability of seeds. It is used in seed warehouses to estimate which lots have a good carry over potential (maintain germination level over prolonged storage). However, a good potential storability is a sign of vigor as well. Therefore, this test is also used to determine the seed vigor of many crops. Before planting for standard germination, the dry seeds are subjected to the stress of high temperatures (40-45°C/130-139°F) and near 100% relative humidity. The stress period varies depending on the kind of seeds (as specified in the AOSA Seed Vigor Testing Handbook), after which seeds are planted in a standard germination test. High vigor seeds that tolerate such harsh conditions retain their capability to produce normal seedlings, whereas poor quality seeds will either die or produce weak, abnormal seedlings. It can be used for corn, garden beans, soybean, sorghum, tall fescue, bromegrass, wheat, small seeded legumes, vegetables, and other crops. Useful in predicting the potential storability as well as the vigor of seeds. It requires an accelerated aging chamber/oven with good temperature control. It also requires additional training for conducting and evaluating the test.